I like a good runner as much as the next guy; any game that requires me to run forward and time my taps to keep my on-screen character alive for as long as possible. From Canabalt to Jetpack Joyride to Temple Run, the key to a good running mobile game is simplicity. Save Them All certainly keeps things simple, though it does add a few gameplay wrinkles to the foundation of its most obvious influence, Adam Atomic's Canabalt. 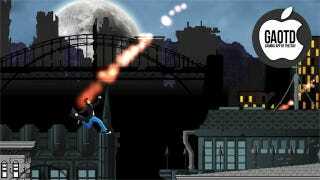 You play a guy who has to run across rooftops during an alien invasion (sound familiar?). However, this particular guy is something of a superhero, and in addition to simply avoiding death for as long as possible, you'll also have to rescue distressed citizens (who are for some reason on the rooftops), collect orbs, and occasionally punch zombies and aliens into bloody pulps. The game gives you a nice set of powers, from double-jumps to air-smashes, all of which unlock over a series of levels. Yeah, levels—in another switch from the typical endless runner-game, Save Them All has levels that you can actually beat. Mind, they're really just time limits that you have to hit, but the sense of progression is markedly different from Jetpack Joyride and Canabalt. That's perfectly okay, it's just different. The game is satisfying, tricky, and compulsive, and is certainly a good way to spend a buck and your next week on public transportation. Just remember: Eyes on the prize, and don't forget to punch those aliens.